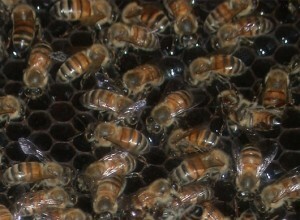 Honey bees in a hive. Photo courtesy of Brenda Kanno. Professional beekeeper Keith Roberts will explore the benefits and risks of urban beekeeping, and discuss the new Los Angeles city ordinance on bee hives at the next CSUN-al Gardening class on Saturday, Dec. 10. A year ago, the Los Angeles City Council overturned a 136-year ban on beekeeping by passing an ordinance allowing honey bee hives on single-family residential properties. Roberts will talk about what that means for local gardeners during his class, “Urban Beekeeping: What’s all the Buzz About?,” scheduled to take place from 9 to 11 a.m.
During his class, Roberts, an urban beekeeper, will explain the important role of honey bees on a local, state and global levels, and what people can do to protect them. He also will discuss the details of the new city ordinance and provide an insider’s view of the benefits and risks of keeping bees, along with general how-to information. Roberts’ interest in honey bees began in 2008, when a visit to the Los Angeles County Fair introduced him to a display of live honey bees. A year later, he founded the Enterprising Bee Company and subsequently created the Save the Buzz line of honey bee products. As a professional beekeeper, Roberts is co-owner of The Valley Hive in Chatsworth and the current president of the Los Angeles County Beekeepers Association. Registration is required for the free class. Please email botanicgarden@csun.edu to request a space in the class or for more information. Driving and parking instructions, as well as the class meeting location, will be sent upon registration. CSUN’s Botanic Garden is operated by the university’s Department of Biology and serves as a field site for botany, entomology, photography, painting and other classes. In addition to geographically themed plantings and a butterfly garden, the garden features greenhouses where noteworthy botanical specimens are grown. It is open to the community. Visit the Botanic Garden’s website, www.csun.edu/botanicgarden, for more information.